TV Anchorman: If witnesses are to be believed, there has been a child security breach for the first time in monster history. CDA Agent: We can neither confirm nor deny the presence of a human child here tonight. Witness #1: Well the kid flew right over me and blasted a car with its laser vision. Witness #2: I tried to get away from it, but he picked me up with his mind powers and shook me like a doll. Witness #3: [has many eyes] It's true! I saw the whole thing! Professor on TV: It is my professional opinion that now it's the time to panic! Celia: [answering phone calls] Monsters Inc., please hold. Monsters Inc., I'll connect you. Mrs. Scaremonger is on vacation. Would you like her voice mail? CDA Agent: Halt! He's the one! The one's from the commercial! Affirmative. That's him. Can we get an autograph? Sulley: [Relieved] Oh! Oh sure! No problem! Sulley: The power's out. Make her laugh again. Mike: All right, I got a move here, it'll bring down the house. Up! Sulley: Oh, sorry, she didn't see that. Mike: What? What'd you do, forget to check if her stupid hood was up, you big dope? Sulley: Uncle Mike, try not to yell in front of her. You know we still need her to laugh. Mike: Right. He-he! Hey, Boo! Just kidding. Look! Mike: Funny, right? Huh? With the... These are the jokes, kid. Sulley: [is fighting the invisible Randall when he is hit with a snowball] Mike? Mike: Look, it's not that I don't care about the kid. Sulley: Mike, you don't understand. Mike: Yes, I do. I was just mad, that's all. I needed some time to think, but you shouldn't have left me out there. Mike: No, I'm not attacking you. I'm trying to be honest, just hear me out. You and I are a team. Nothing is more important than our friendship. Mike: I-I know, kid. He's too sensitive. 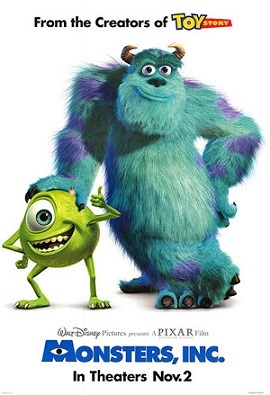 Mike: [Sulley is being strangled] Come on, pal. If you start crying, I'm gonna cry, and I'll never get through this. I'm sorry I wasn't there for you, but I am now. Hey, Sulley, I am baring my soul here. The least you can do is pay attention! Mike: Hey, look at that, it's Randall. It's... Oh. Sulley: [tearfully] I can still hear her little voice. Boo: [from down the hall] Mike Wazowski! Mike: [while Sulley brushes teeth] C'mon, fight that plaque! Fight that plaque! Scary monsters don't have plaque! Celia: Michael, if you don't tell me what's going on right now, we are through! You hear me? Through! Mike: Okay, here's the truth. You know that kid they're looking for? Sulley let her in. We tried to get her back, but Waternoose had a secret plot, and now Randall's right behind us, and he's tring to kill us. Celia: You expect me to believe that pack of lies, Mike Wazowski? Boo: [peeking from Sulley's shoulder] Mike Wazowski! Sulley: What have I done? This could ruin the company. Mike: Who cares about the company? What about us? That thing is a killing machine! Mike: I bet it's waiting for us to fall asleep, and then - bam! Oh, we're easy prey, my friend. Easy prey! We're sitting targets! Mike: Hey, genius. Wanna know why I bought the car? Mike: To drive it! You know, like on the street? With the honk-honk and the vroom-vroom, and the no walking involved? Sulley: Wah, wah, wah. Will you give it a rest, butterball? C'mon, you could use the exercise. Mike: I could use the exercise? Look at you. You have your own climate. Yeti: Abominable. Can you believe that? Do I look abominable to you? Why can't they call me the Adorable Snowman, or the Agreeable Snowman, for crying out loud? I'm a nice guy. Sulley: We need to get to Boo. Mike: [Throws a snowcone at him] Boo? What about us? Mike: Ever since that kid came in, you've ignored everything I've said, and now look where we are! Mike: Oh, we were about to break the record, Sulley. We would've had it made! Sulley: None of that matters now. Mike: None of it matters? Wa-wait a second. None of it matters? Oh, okay, that's - no. Good. Great. So now the truth comes out, doesn't it? Yeti: Oh, would you look at that? We're out of snowcones. Let me... just go outside and make some more. Mike: Sulley, what about everything we ever worked for? Does that matter? Huh? What about Celia? I am never... never gonna see her again. Doesn't that matter? What about me? I'm your pal, I'm-I'm your best friend. Don't I matter? Mike: We? Whoa, whoa. We? No. There's no we this time, pal. If-if-if you want to go out there and freeze to death, you be my guest, because you're on your own. Mike: Good morning, Roz, my succulent little garden snail. And who will we be scaring today? Roz: Wazowski! You didn't file your paperwork last night. Mike: Oh, that darn paperwork! Wouldn't it be easier if it all just blew away? Roz: Don't let it happen again. Mike: Yes, well, I'll try to be more careful next time. Roz: I'm watching you, Wazowski. Always watching. Always. Mike: Ooh, she's nuts. Ward: The kid almost touched me. She got this close to me. Ward's Assistant: She wasn't scared of you? She was only six. Ward: [shakes his assistant] I could have been dead. I could have DIED. Ward's Assistant: [slaps Ward] Keep it together, man. Boo: [giggles and opens her closet door] Boo!... Kitty? Waternoose: Now, give us a big loud roar. Sulley: Mr. Waternoose, there's no time for this! Waternoose: C'mon, what're you waiting for? Roar! Sulley: Ohh. [ferociously roars at the boy] GROAR! Waternoose: Well done. Well done, James! Mike: I can't believe that we're waltzing up to the factory! Mike: Hey, hey, that's it! No one touches little Mikey. Trailer Son: [after Sully throws Randall into a door and destroys it] Mama! 'Nother gator got in the house! Trailer Mom: Another gator? Gimme that shovel! Mike Wazowski: I have no idea. But it would be a really good idea if it didn't do it again. Randall: [after whacking Sully with a scream canister] You don't know how long I've wanted to do that, Sullivan! Randall: I'm in the zone today, Sullivan. I'm gonna do some serious scaring, putting up some big numbers. Mike: Someone else will find the kid. I'll be their problem, not ours. She's out of our hair! Monster: They're rehearsing a play. Mike: [singing] She's out of our hair...! Mike: [as the Scream Extractor approaches] What is that thing? What is that thing? Hey, hey, hey, that thing is moving. I don't like big, moving things that are moving towards me. Roz: None of this ever happened, gentlemen. And I don't want to see any paperwork on it. Mike: You're the boss! You're the boss! You're the big, hairy boss! Yeti: No, no, no, don't worry. It's lemon. Henry J. Waternoose: No, no, no, no, no. What was that? You're trying to scare the kid, not lull it to sleep. Bile: I was going for a snake-slash-ninja approach, with a little hissing. [hisses] Henry J. Waternoose: How many times must I tell you? It's all about presence. About how you enter the room. Randall: Shh. Shh. Shh. Shh. Do you hear that? It's the winds of change. Henry J. Waternoose: Well, Jerry, what's the damage so far? Jerry the floor manager: We may actually make our quota today. Henry J. Waternoose: Hmm, first time in a month. Mike: Get out of here. You're ruining everything. Sulley: I went back to get your paperwork and there was a door. Sulley: Randall was in it. Mike: Wait a minute, Randall? That cheater! He's trying to boost his numbers. Sulley: Ook-lay in the ag-bay. Sulley: Look in the bag. Mike: Hello, is this thing on? Hey, good evening, ladies and gentlemen. Nice to be here in... your room. Hi, where are you from? Mike: You're in kindergarten, right? I used to love kindergarden. Best three years of my life. Mike: Of my life. But I love sports. Dodge ball was the best. I was the fastest one out there. Course, I was the ball. You see, I... was the ball. All right, kid. Mike: Thank you! You've been a wonderful audience. I'll be here all week. Don't forget to tip your waitress. Mike: Come on, the coast is clear. Ok, all we have to do is get rid of that thing, so wait here while I get its card key. Sulley: But she can't stay here this is the men's room. Mike: That is the weirdest thing you have ever said. Its fine, it's ok! Look, it loves it here, its dancing with joy! Mike: I'll be right back with its door key. Sulley: [laughs] That's a cute little dance you got. Almost looks like you gotta - Oh. Randall: So, how about this kid getting loose? Crazy, huh? Randall: Word on the street is the kid has been traced to the factory. Know anything about that? Sulley: Uh, no, uh... Mike: No, no way. But if it was an inside job, I'd put my money on Waxford. Mike: Yeah, works over in sector 6, he's got those shifty eyes. Henry J. Waternoose: What a day. Sulley: It's just a rough patch, sir. Everyone knows you'll get us through it. Henry J. Waternoose: Tell that to the board of directors. Sulley: [Boo is hopping up and down like she has to use a toilet] Say, that's a cute little dance you got there. It almost looks like you have to... Oh! Sulley: [Mike is complaining about walking to work instead of driving, he looks up at a monster with giant dinosaur feet and legs] Morning Frank! Sulley: See Mike? Frank walks to work. Mike: Big deal, the guy takes five steps and he's there. Randall: Sh sh sh! You hear that? It's the winds of change. Lucius: What are we doing here, Bob? Bob: You need an invitation? Lucius: I'd like one, yes. We keep sneaking around, and... You remember Gazer Beam? Bob: Yeah, there was something about him in the paper. Lucius: He had trouble adjusting to civilian life too. Bob: When was the last time you saw him? Lucius: I don't see anyone from the old days, Bob, just you, and we're pushing our luck as it is. Mike: One, two, three, four, get the kid back in the door! Mike: [unlocks his car] Come on, hop on in. Sulley: No way, there's a scream shortage. We're walking. Mike: Scary feet, scary feet, scary feet, scary feet, oop! The kid's awake! Mike: Okay, scary feet, scary feet, scary feet, scary feet, kid's asleep! Mike: Twins! In a bunk bed! Mike: Darn I thought I had you with that one! Sulley: [Sulley and Mike have just been banished to the Himalayas on Earth - Sulley opens the door to find nothing beyond it] BOO! Sulley: [Opens and closes door, pushes frame, nothing happens] No, no! No, no, no, no, NO! Mike: It's too late! We're banished, genius! We're in the human world! Oh, what a great idea; goin' to your old pal Waternoose! Too bad he was in on the whole thing! All you hadda do, was listen to me, just once! But you didn't, did you? Mike: YOU'RE STILL NOT LISTENING! Yeti: You wanna go to the village? Okay, rule number one out here: Always... no, Never go out in a blizzard. Sulley: Nice job, Mikey. You filled your quota on the first kid of the day. Mike: You know, only someone with great comedic timing could produce this much energy in one shot. Sulley: Uh-huh, and the fact that laughter has ten times the energy of scream had nothing to do with it. Mike: She's the one. I'm telling ya, she is the one. Sulley: I'm happy for you. Mike: Oh, by the way, thanks for hooking me up with those reservations. Sulley: No problem. They're under the name Googlie-Bear. Mike: Thanks, I... you know, that isn't very funny. Randall: [to Sulley, hanging on from a door] Look at everybody's favorite scarer now, you stupid, pathetic waste! Randall: You've been number one for too long, Sullivan. Now your time is up. And don't worry, I'll take good care of the kid. Sulley: She's not scared of you any more. Sulley: Looks like you're out of a job. Randall: Well what do you know? It scares little kids and little monsters. Mike: I wasn't scared, I have allergies. Mike: Come on, it slides, it slides! Henry J. Waternoose: Our city is counting on you to collect those screams. Without scream, we have no power. Yes, it's dangerous work, and that's why I need you to be at your best. I need scarers who are confident, tenacious, tough, intimidating. I need scarers like... like... James P. Sullivan. Charlie: [Trying to reassure George, who is in crutches after too many encounters with the CDA] Now, George, I know you can do this. I picked out an easy door for you, in Nepal. Nice, quiet Nepal. George Sanderson: You know, you're right. Here, Take this. Charlie: Go get 'em, Georgie. Sulley: Gangway! Look out! Coming through! Sorry, George. Sulley: Give me a break, Mike. Sulley: Guys, I told you, call me Sulley. Smitty: [Giggling] I don't think so. Needleman: We just wanted to wish you good luck today. Mike: Hey, hey, hey, hey. Come on, get lost, you two. You're making him lose his focus. Sulley: See you later, fellas. Smitty: Go get 'em, Mr. Sullivan! Needleman: Quiet! You're making him lose his focus. Mike: Sir, that's not her door. Henry J. Waternoose: ...It's yours. Mike: Why couldn't we have been banished here? Mike: I'm telling you, Big Daddy. You're gonna be seeing this face on TV more often. Sulley: Yeah, like on "Monstropolis' Most Wanted"? Mike: Ha, ha, ha. You've been jealous of my good looks since the fourth grade, pal. Celia: So, uh... are we going anywhere special tonight? Mike: I-I just got us into a little place called, um... Harryhausen's. Celia: Harryhausen's? But it's impossible to get a reservation there. Mike: Not for Googlie Bear. I will see you at quitting time, and not a minute later. Mike: You and me, me and you, both of us together! Mike: [Spotting Sulley while he's working out] 118. Do you have 119? Do I see 120? Oh, I don't believe it! Sulley: I'm not even breaking a sweat. Mike: Not you! Look! The new commercial's on. Mike: [chanting] I don't know, but it's been said, I love scaring kids in bed! Mike: Just think about a few names for a second: Bigfoot. Loch Ness. The Abominable Snowman. They all have one thing in common, pal: Banishment! We could be next! Sulley: Mike, this isn't Boo's door. Sulley: That's... what I decided to call her. Is there a problem? Mike: Oh, hey. We're rehearsing a - a scene for the upcoming company play called uh, Put That Thing Back Where It Came From Or So Help Me. It's a musical. Mike: Put that thing back where it came from or so help me... so help me, so help me and cut. We're still working on it, it's a work in progress but, hey, we need ushers. Randall: the door will be gone. You have until then to put the kid back. Get the picture? Randall: Wazowski! Where is the kid, you little one-eyed cretin? Mike: Okay, first of all, it's "creetin". If you're gonna threaten me, do it properly. Second of all, you're nuts if you think kidnapping ME is gonna help YOU cheat your way to the top. Randall: [chuckles evilly] You still think this is about that stupid scare record? Mike: Well... I did. Right up until you... chuckled... like that... And now I'm thinking I should just get out of here. CDA Agent: This is the CDA. Come out slowly with the child in plain sight. Mike: [Stepping out from behind the door with Boo's costume] Okay, okay! You got us. Here we are, here's the kid. I'm cooperating. But before you take us away, I have one thing to say. CDA Agent: [as the others jump over the guy who gets the sock] 23-19! Celia: [wearing a cone after being treated by the CDA] Last night was one of the worst nights of my entire life, bar none! Celia: I thought you cared about me. Mike: Honey, please. Schmoopsie, I thought you liked sushi. Celia: Sushi? Sushi? You think this is about sushi? Yeti: [Referring to despondent Sully] Aw, poor guy. I understand. It's not easy being banished. Take my buddy Bigfoot. When he was banished he fashioned an enormous diaper out of poison ivy. Wore it on his head like a tiara. Called himself "King Itchy". Sulley: Oh. So that's puce. Mike: Oh, that's great, blame it on the little guy. How original. He must've read the schedule wrong with his one eye. Mike: On my desk, Sulley. The pink copies go to Accounting, the fuchsia ones go to Purchasing, and the goldenrod ones go to Roz. Leave the puce. Henry J. Waternoose: James, this company has been in my family for three generations. I would do anything to keep it from going under. Sulley: So would I, sir. Henry J. Waternoose: Say, I could use your help with something. Henry J. Waternoose: Oh, they stink! Sulley: Uh-huh. Henry J. Waternoose: I thought you could drop by the simulator tomorrow and give them a little scare demonstration, show them what it takes to be our top scarer. Sulley: I'll start with the old Waternoose Jump-and-Growl. Henry J. Waternoose: [Startled] Oh! Ha ha! That's my boy. Bile: Uh... it could let in a draft? Henry J. Waternoose: [Storming in] It could let in a child. Mike: Roz, my tender, oozing blossom, you're looking fabulous today. Is that a new haircut? Come on, tell me it's a new haircut, isn't it? It's got to be a new haircut. New makeup? You had a lift? You had a tuck? You had something? Something has been inserted in in you that makes you look... Listen, I need a favor. Randall was working late last night out on the scare floor. I really need the key to the door he was using. Roz: Well, isn't that nice? But guess what? You didn't turn in your paperwork last night. Mike: He didn't... I... no paperwork? Roz: This office is now closed. Mike: Psst, Fungus. Fungus, you like cars? Because I got a really nice car. You let me go, I'll give you... a ride... in the car. Fungus: I'm sorry, Wazowski, but Randall said I'm not allowed to fraternize with victims of his evil plot. Mike: Hello. Hey, where are you going? C'mon, we'll talk! We'll have a latte! Mike: Hey, good morning, Monstropolis. It's now five after the hour of 6:00 A.M. in the big monster city. Temperature's a balmy 65 degrees, which is good news for you reptiles, and it looks like it's gonna be a perfect day to maybe, hey, just lie in bed, sleep in, or simply... Work out that flab that's hanging over the bed! Get up, Sulley! Sulley: I don't believe I ordered a wake-up call, Mikey. Mike: Hey, less talk, more pain, marshmellow boy! Mike: Oh, you should have seen the look on Waternoose's face when that wall went up. Woo-hoo! I hope we get a copy of that tape. Hey, you all right? Come on, we did it. We got Boo home. Sure, we put the company in the toilet, and, gee, hundreds of people will be out of work now, not to mention the angry mob that'll come after us when there's no more power... but hey, at least we had a few laughs, right? Henry J. Waternoose: I shouldn't have trusted you. Because of you, I had to banish my top scarer. Randall: Ah, with this machine, we won't need scarers. Besides, Sullivan got what he deserved. Henry J. Waternoose: Sullivan was twice the scarer you'll ever be! Charlie: Twenty-three nineteen! We have a Twenty-three nineteen! Mike: Sulley, what are we doing? Sulley: We have to get Boo's door and find a station. Mike: What a plan. Simple, yet insane. Randall: I am about to revolutionize the scaring industry, and when I do, even the great James P. Sullivan is gonna be working of me. Henry J. Waternoose: I hope you're happy, Sullivan. You destroyed this company. Monsters Incorporated is dead! Where will everyone get their scream now? The energy crisis will only get worse, because of you! Mike: That's it, I'm out of ideas. We're closed. Hot air balloon? Too expensive. Giant slingshot? Too conspicuous. Enormous wooden horse? Too Greek. Sulley: Are there kids in that village? Yeti: Welcome to the Himalayas. Mike: Follow the sultry sound of my voice. Sulley: Hey... may the best monster win. Henry J. Waternoose: This has gone far enough, James. Sulley: She's home now. Just leave her alone! Henry J. Waternoose: I can't do that, James. She's seen too much. You both have. Sulley: It doesn't have to be this way. Henry J. Waternoose: I have no choice. Times have changed. Scaring isn't enough anymore. Henry J. Waternoose: I'll kidnap a thousand children before I let this company die, and I'll silence anyone who gets in my way! Henry J. Waternoose: [confused] Huh? But... What? Mike: I don't know about you guys, but I spotted several big mistakes. You know what? Let's watch my favorite part again, shall we? Mike: Look at the big jerk. He ruined my life, and for what? A STUPID KID! Because of you, I am stuck in this frozen wasteland! Yeti: Wasteland? I think you mean "Wonderland"! I mean, how about all this fabulous snow, huh? Oh, and wait until you see the local village, cutest thing in the world. I haven't mentioned all the free yak's milk. Sulley: Wh... What did you say? Yeti: Yak's milk. Milking a yak isn't exactly a picnic; but once you pick the hairs out, it's very nutritious. Sulley: Mike, that's not her door. Mike: What are you talking about? Of course it's her door. It's her door. Sulley: No. Her door was white and it had flowers on it. Mike: No. It must've dark last night because this is its door. Mike: [to Boo] You hear that? Sounds like fun in there. Well, see ya kid. Send me a postcard. That's Mike Wazowski, care of 22 Mike Wazowsi-You-Got-Your-Life-Back-Lane. Mike: Very good. Now bon voyage. See ya. [waves a stick in front of Boo as if she were a dog] Mike: Look at the stick. See the stick? [throws the stick through the door] Mike: Go get the stick. Go fetch. Roz: Hello, Wazowski. Fun-filled evening planned for tonight? Roz: Then I'm sure you filed your paperwork correctly, for once. Roz: Your stunned silence is very reassuring. Mike: One of these days I am really... going to let you teach that guy a lesson. Sulley: Hey, Ted! Good morning! Sulley: See that, Mikey? Ted's walking to work. Mike: Big deal. Guy takes five steps and he's there. Celia: Oh, Michael, I've had a lot of birthdays - well, not a lot of birthdays but this is the best birthday ever. Celia: What are you looking at? Mike: I was just thinking about the first time I laid eye on you, how pretty you looked. Mike: Your hair was shorter then. Celia: Mm-hmm. I'm thinking about getting it cut. Mike: I like everything about you. Just the other day someone asked me who I thought the most beautiful was in all of Monstropolis. You know what I said? Celia: What did you say? Sulley: Hey, Mike, this might sound crazy but I don't think that kid's dangerous. Mike: Really? Well, in that case, let's keep it. I always wanted a pet that could kill me. Sulley: Hey, that looks like Randall. Randall's your monster. You think he's gonna come out of the closet and scare you? Sulley: Look, it's empty. No monster in here. Okay, NOW there is. I'm not gonna scare you. I'm off duty. Babysitter: Well, hello there. What's your name? Henry J. Waternoose: Well hello, little one. Where did you come from? Henry J. Waternoose: Ah, James. Is this one yours? Sulley: Ah, actually that's my uh, cousin's sister's daughter, sir. Mike: Yeah, it's uh, "Bring an Obscure Relative to Work Day". Henry J. Waternoose: Hmm, must have missed the memo. Needleman: So I said, "If you talk to me like that again, we're through." Smitty: Oh! What did she say? Needleman: You know my mom. She sent me to my room.